Gold Lion Tamarins Conservation Project, guided tour. 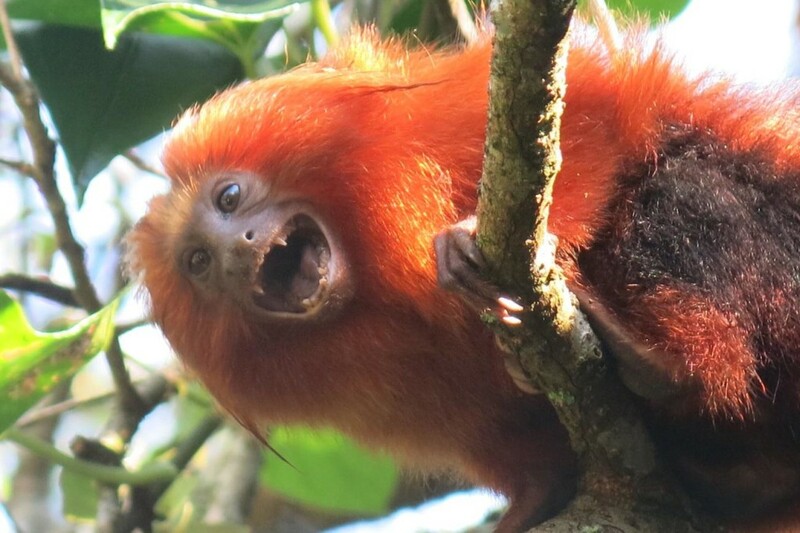 If you are traveling to Rio de Janeiro and want to see these lovely creatures, & Rio Native & Yourguideinrio is providing a special guided visit to The Golden Lion Tamarins (GLT) in the wild. The GLT Sanctuary is located northeast of Rio at the Poço das Antas Biological Reserve municipality of Silva Jardim, a reserve dedicated to protecting the coastal Atlantic Forest ecosystem, its native wildlife, and to preserve endangered species. 08:30 a.m. Private Farm – The tour starts at 8:45hs and over the next 2 hours you will have ample opportunity to photograph these beautiful tamarins. ​10:30 a.m. Golden Lion Tamarin Project – After viewing the tamarins we will proceed to the Enviroment Educational Center in the Poço das Antas Biological Reserve where you can see the exhibits and if you wish purchase souvenirs such as t-shirts, caps, and more (all of which support AMLD’s GLT conservation program). You will have an opportunity to meet additional AMLD staff members who will tell you about their conservation program to restore the forest and the tamarin populations assuring this species have a future in the wild. 1:30 p.m. Poço das Antas back to Rio de Janeiro. At 1 pm you rejoin your vehicle for the return journey arriving to your hotel about 3 pm where your guide will say goodbye and you will have had a unique and very personal experience meeting these beautiful monkey’s. Estimated time arrive at your hotel around 3.00 pm. Land Price (6 hours tour including driving time from Rio to Silva Jardim & return) = US$ 430 per person. The land price includes escorted transfers, excursions with a naturalist guide , breakfast, all land transportation. Please note: Proceeds from your tour help support the conservation of golden lion tamarins in their natural habitat. Your visit also promotes forest-friendly income generation for the local community, thus contributing to the long-term protection of golden lion tamarin habitat. Important: Original yellow fever vaccination certificate is required. Vaccination to be taken at least 15 days prior to visit day.